Instagram’s newest feature, Instagram Direct, allows its users to share photos and videos with select people. Snapchat, a rapid photo-sharing app, also allows its users to share photo and video content. Sound the same? Think again! Whether you are sharing a picture of a sunset or a selfie, there are benefits to using each sharing service. Read below for six reasons Instagram Direct and Snapchat are very different. Instagram Direct allows IG users to share photos and videos with select people they follow. Those with access to the photo can like and comment as if it were any other photo or video on IG. With Snapchat, there is not a feature that allows for group discussions to take place directly on the photos or videos shared. With Instagram Direct, recipients of a photo or video can view others the sender shared the content with. Snapchat does not reveal this information. 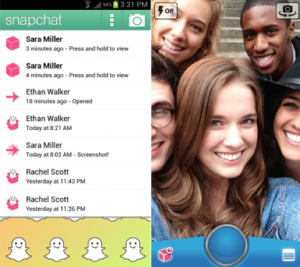 Snapchat allows users to send photos and videos that disappear after the recipient views the content once. Snapchat users can also share “stories” that will remain viewable for 24 hours. Photos and videos shared using Instagram Direct never expire. They remain viewable to those with access until the sharer deletes the item or a recipient swipes left to “hide” it. Snap a screenshot? Snapchat will let users know when a screenshot of their content is taken, but Instagram direct does not have a screenshot notification system in place. 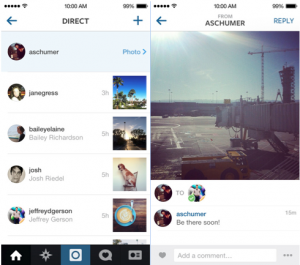 Users can share photos and videos they have previously taken when using Instagram Direct. 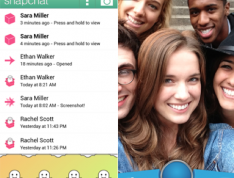 Snapchat requires users to use the in-app camera for content sharing.